Whether it’s your Master bath, Guest bath or the humble Powder room, choosing the right mirror adds instant cohesion to your space. A good bathroom mirror can make a small room larger, a dark room brighter and in some cases, tell you what the weather’s going to be like without having to step foot outside. So now that we’ve got you thinking about a new mirror, let’s go over a few quick rules to keep in mind. Placement – Remember to take fixtures into consideration. Things such as light sconces, hand towel holders, wall mounted soap and toothbrush holders and electrical outlets should all be at the very least, a good ¼” distance between these items and the outer edge or frame of the mirror. Height – Consider who will be using this mirror most often and then ensure the height makes sense. Most bathroom mirrors are large enough to cover a variety of heights, but it’s always smart to check and measure first, especially if there is a significant difference in height between you and your significant other. 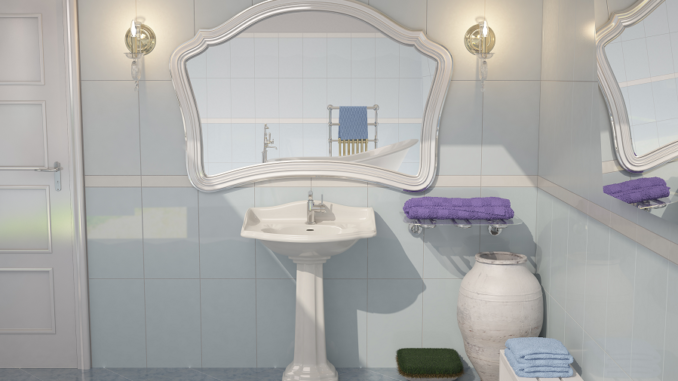 Aesthetics – Usually the mirror is one of the last purchases in a bathroom. Other items, such as the toilet, shower and sinks are pre-determined by the location of the plumbing. Shelves and cabinets are placed on wall locations not taken up by the windows, and usually near the outlets so as to have easy access for electrical items. That means that most likely you’ve already done the due diligence of choosing certain finishes, colors and style of your room. So when shopping around, keep in mind what metals, stone/tile, wall colors and wood tones you have already cultivated into the overall look of your bath. Now, a quick bit of advice, specifically as it relates to stained wood…matching correctly the same stain of wood can be extremely hard unless you’re purchasing the mirror from the same manufacturer as your vanity. Most of us don’t do this, and can find ourselves frustrated. Putting close-but-not-quite similar wood tones against each other can quickly look like you tried to be matchy-matchy and failed. If you are set on the idea of a stained wood vanity and a stained wood mirror frame, our expert advice is to pull from the tones of the vanity and go with a complementary but different shade. Examples – if you vanity is a cherry stain, that would be a red tone, so something mahogany or cedar would work, or if you’ve got a dark oak, that’s usually a yellow-orangey tone, therefore a lighter, golden tone such as pecan or honey maple could work quite nicely. If your vanity has more than one wood color, match the less dominant color to highlight. MODERN – Modern style is sleek, without much ornamentation. Look for metal tones that match your bathroom hardware and faucets, simple style wood or if you can’t decide between, frameless is also a good option for this style. TRADITIONAL – On the opposite end of modern comes traditional. Shapes are usually rectangular or oval with lots ornamental touches and flourishes, or curved into pleasing, architectural patterns. Frames are extremely common with this style. CREATIVE – Spanning the definition between modern and traditional is creative. Like traditional, you can have ornate shapes, but creative style adds in some whimsy and funk. Colors and unexpected textures define this style, with the key being fun. THEMED – Beyond just the general styles mentioned, a lot of people have a curated theme to their bath, if not also encompassing their entire home. Popular themes like Nautical, MCM (Mid-Century Modern), Modern Farmhouse and Retro can help guide you in finding that perfect mirror to complete the look you’ve so carefully crafted. SMART TECH – Home technology has come a long way and bathroom mirrors have too. Why waste valuable wall space on a sconce for task lighting when you can have the task lighting built into the mirror? Maybe you’re the type of person who loves their shower as hot as you can get, but doesn’t want to have to wait for your mirror to defog? Or maybe you’re a busy professional on the go who needs to be in touch with what’s going on in the world before you ever step foot out your door? There’s a mirror for each of you, if you’re willing to pay a little (or in some cases, a lot) more than you would for your standard piece of glass. Whatever your decision, use your lifestyle, personal taste and decorating preferences in your process, and you’re sure to be pleased with your find.